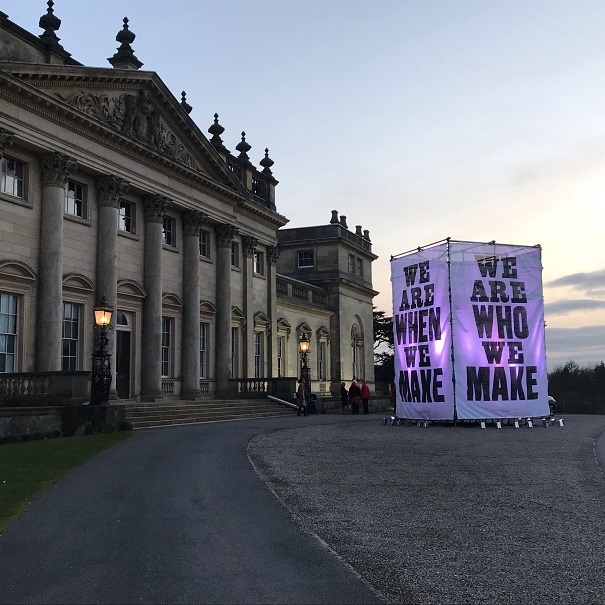 An all encompassing definition and one beautifully illustrated by the Useful/Beautiful: Why Craft matter exhibition launched as the first biennial at Harewood House in Yorkshire. 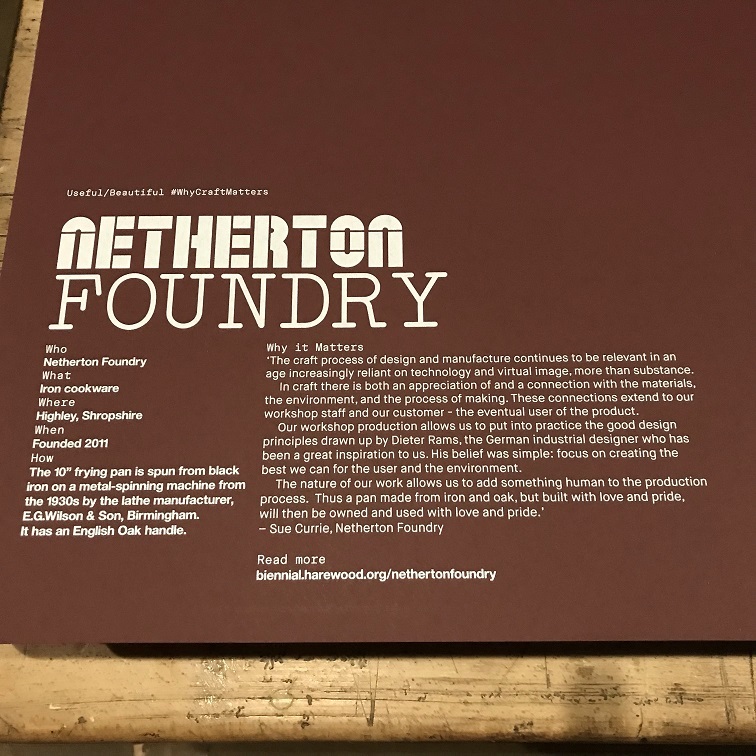 On the 21st March, in the company of many of the other 25 makers represented in the exhibition and a selected guest list, we were present at the private view, where we saw the stages of a Netherton frying pan from start to finish beautifully displayed in the main kitchen – yes, there is more than one kitchen. This even included one of the pans from our own kitchen, to show that the pans, whilst lovingly made, really come into their own when they reach a loving home and are used and used! This was a recurrent theme throughout the house; an investment in materials and the time and skills of the makers to produce items of Usefulness and Beauty, with stories to tell and retell for years to come. In a stunning house, built in the 18th century and home to the Earl and Countess of Harewood, which already houses “art collections to rival the finest in Britain” (and which ranges from Joshua Reynolds to Jacob Epstein), the Useful/Beautiful exhibition explores and demonstrates Why Craft Matters; what craft means, who are the 21st century crafts people, where craft fits in today’s world, who is craft for. The exhibition opens to the public on Saturday 23rd March and we would, naturally, urge you to visit. 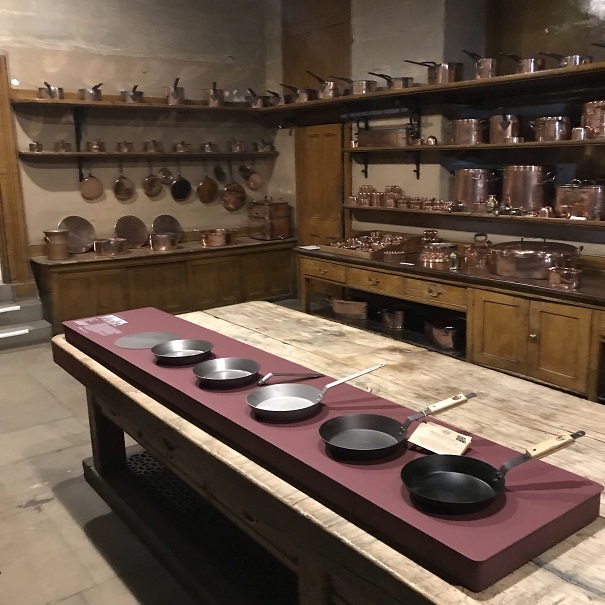 In itself it is worth the trip, but one of the joys of this exhibition is the glorious setting and the siting of each exhibit in a historic room – you will find us in the kitchen! On the 29th of March the Daily Telegraph reviewed the exhibition, you can read the on-line edition of the review here.